It is often useful to know windows uptime. This is necessary mainly for the maintenance and troubleshooting of your PC. Some computer users hate to reboot PC never/rarely turn it off. Such practice may affect PC performance in long term and as a part of troubleshooting they may need to checkout the time you last turned on your computer. There are a number of ways to find out system up-time. In this post I have discussed 5 methods. This is the easiest & quickest way to find out windows uptime. But it is for Windows Vista & higher versions. Find ‘Up Time‘ under System. The displayed time is in d:hh:mm:ss format. This is also easy to carry out but is available for Windows XP & higher versions. Windows XP Home is not supported. Type systeminfo and press enter. After a few second, you will see a range of system information being listed there. Find the line that says System Up Time or System Boot Time [for Windows Vista Business 64-bit and Windows 7]. You will see that the system boot time has been listed there. You may also add specific switch to systeminfo for getting only the system boot time. The command is systeminfo | find /i “up time” or systeminfo | find /i “boot time” [for Windows Vista Business 64-bit and Windows 7]. or, systeminfo | findstr “Time:” for all versions. Net Statistics displays the statistics log for the local Workstation or Server service, or the running services for which statistics are available. This command is available on Windows 2000 & higher versions. Type net statistics workstation and press enter. In the results, find the line that starts with Statistics since. You may also use net stats workstation command. or, net statistics server command. or, net stats srv command. Windows Management Instrumentation (WMI) is a set of extensions to the Windows Driver Model that provides an operating system interface through which instrumented components provide information and notification. This command is available on Windows 2000 & higher versions. Type wmic os get lastbootuptime and press enter. In the results, find the Windows Boot Time in yyyymmddhhmmss format. So, as shown in the following screenshot, 20120826105027 means that the system has been booted on 26th August, 2012, 10:50:27 hrs. Uptime.exe can be used to display the current uptime of the local or remote system. This tool can be used to display Windows up-time in Windows NT & above versions. Go to the software webpage. and download it. It will be downloaded as a Zip Archive. Extract the contents of the archive and move/copy uptime.exe to Windows NT directory or to C:WindowsSystem32. Type uptime and press enter. Both the time of system boot and the time spent since then will be displayed. The exact text and date format in command prompt is dependent on the language and locale of Windows. The Up-time from different tools may differ a bit since they rely on different parameters. In special cases, they may differ considerably e.g. if Windows Management Instrumentation or Net Statistics had been restarted & reset. 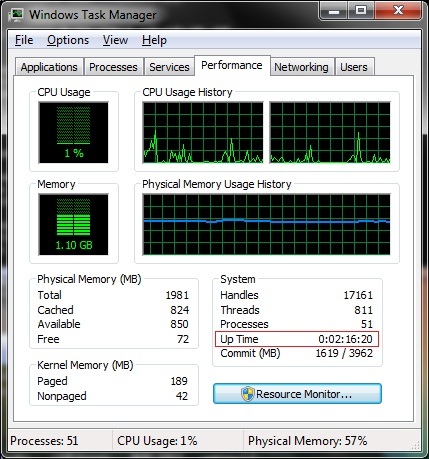 This entry was posted in Free, OS Enhancement, OS Maintenance, Software, Tips, Windows and tagged Computer Uptime, net statistics server, net stats workstation, uptime.exe, Windows commands, Windows Management Instrumentation, WMI.